Killer Education – Will Lysol Kill My Plant? 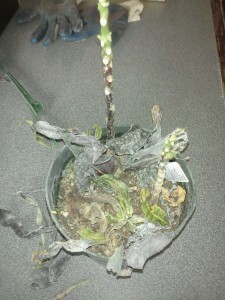 Usually my answer was a quick “no, it won’t kill your plant but it won’t look pretty” because after years of pesticide use I’ve learned that almost anything that comes in an aerosol can has the potential to burn plants with flowers, usually the most desirable part of the plant being the most susceptible to damage. About a month ago, while on my way to clean the bathroom at work I noticed that a bottle of non aerosol Lysol had appeared in the supply closet. This made me wonder if I was wrong about Lysol and excited to try a very informal experiment. 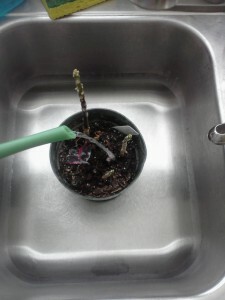 I then sprayed the plant with Lysol to drip. 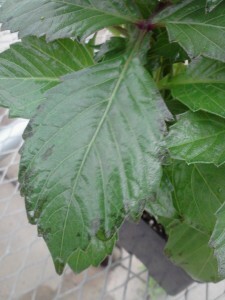 That means I applied Lysol just until the spray began to bead on the leaf and started to drip off in order to ensure complete leaf coverage. This is a common method for applying fungicides that would normally take care of powdery Mildew. It was even within the first hour that it showed signs of tissue damage around the outsides of the leaves and the once beautiful blossom started to wilt and showing some very noticeable spotting. I knew this wasn’t going to be good. By then most of the plant was crisp and anything living was looking rather weak. I was right – Not good. On the bright side, I’m sure the powdery mildew didn’t make it through this either. 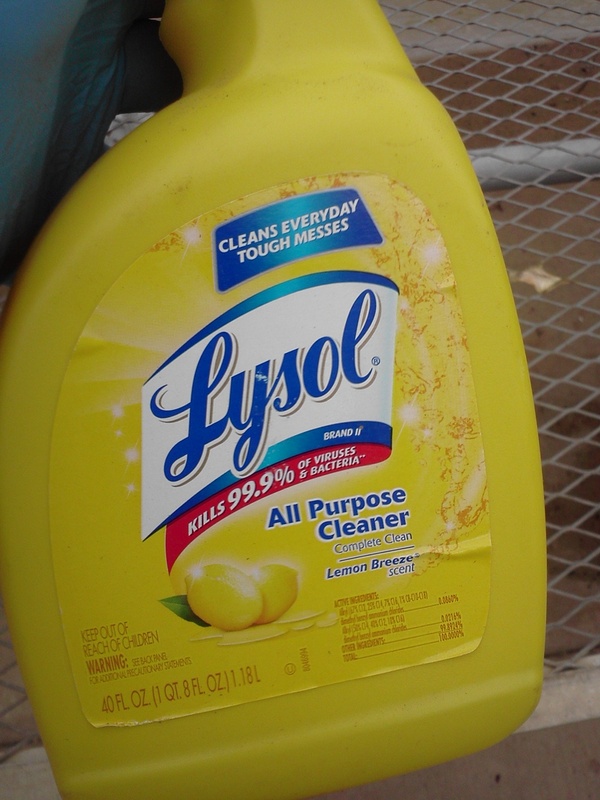 Even the non-aerosol version of Lysol will probably do horrible damage to your plants. 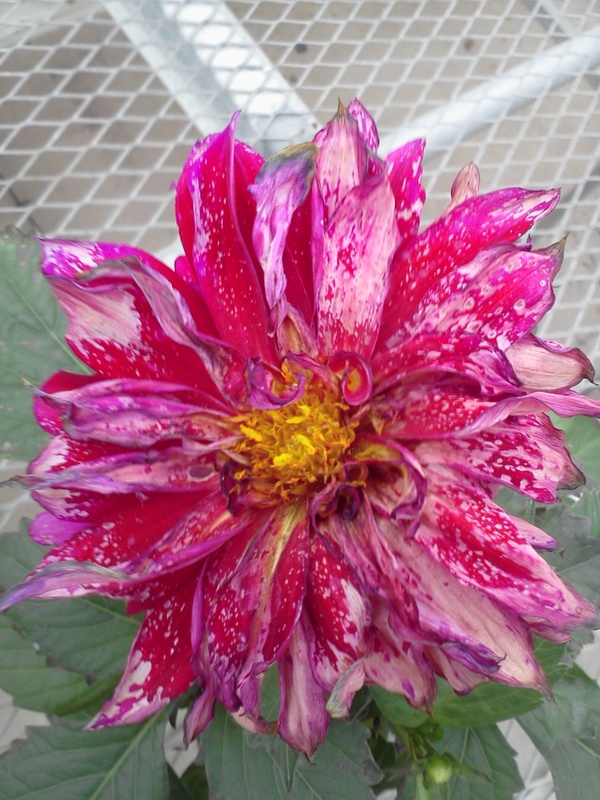 Technically the spray didn’t kill the dahlia but it had no realistic chance of being revived to a healthful vigor by the end of the growing season so I had to put it out of its misery. 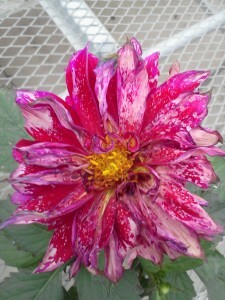 This still leaves a few questions because dahlias might be particularly sensitive to the ingredients but considering the speed at which the negative effects of the spray set in and the severity of the damage I’m erring on the side of most plants being susceptible of burns. For now I’m going to recommend staying away from using Lysol on plants. 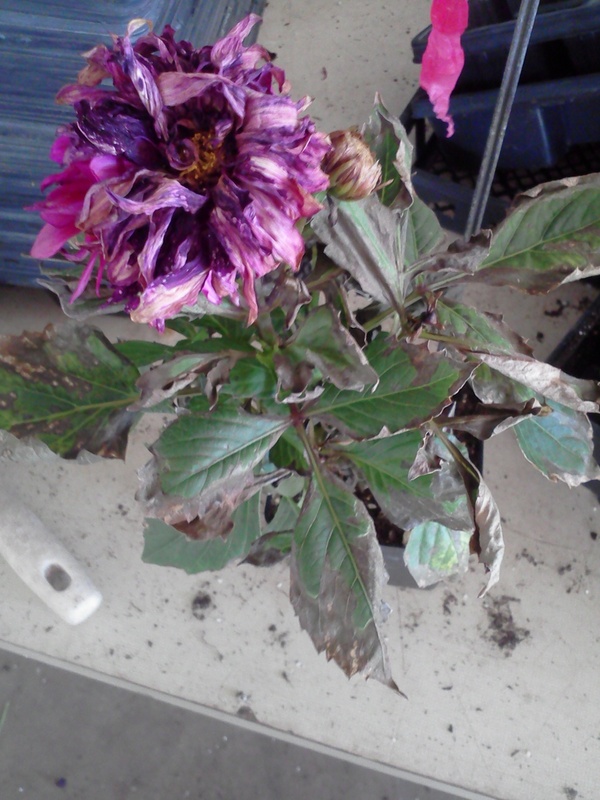 This entry was posted in Killer Education and tagged aerosol, burning, dahlia, Lysol, Powdery Mildew on July 26, 2013 by Steve. Begonias are excellent plants for indoors and out with their vibrantly colored rose-like flowers or vivid, iridescent leaves they easily brighten up the darkest of shady areas. They normally grow fine with minimal water requirements and little other care but once and a while you’ll notice that your colorful friends have a white powder on their leaves and they begin to look stunted. This is powdery mildew, a fungal disease that begonias are notorious for getting during periods of warm days, cool nights and dry soil. If your begonia is indoors you should bring it outside and cut off infected leaves. In order to prevent the disease from spreading to uninfected leave, spray the remainder of the plant with “No Powdery Mildew” fungicide. After your plant has had some time to air out, move your plant to a new home where it will get more sunlight. Make sure to keep the soil moist as this will inhibit reinfection. 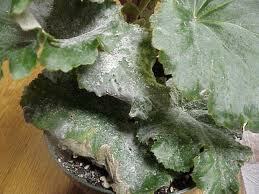 This entry was posted in Killer Education and tagged Begonia, Powdery Mildew, White Powder on June 11, 2013 by Steve. Everything is just fine – You’ve been diligently watering your plants, they look healthy, lush, and beautiful but you notice a yellow leaf near the bottom of your peace lily. As you reach in to cut off the yellow leaf a cloud of small gnat-like bugs swarm around your arm. Ack! What are these horrible little bugs? Are they killing my plant? What are they doing here? What you are seeing is most likely to be one of the most common house plant pests: fungus gnats. Fungus gnats are tiny flies that buzz around the soil surface and lower leaves of your plants. Not much other than fly around and mate but the grub-like larvae of this insect squirm around in the soil eating roots and other assorted things living in the soil environment. If it’s new it could have been living in the soil when you purchased the plant. 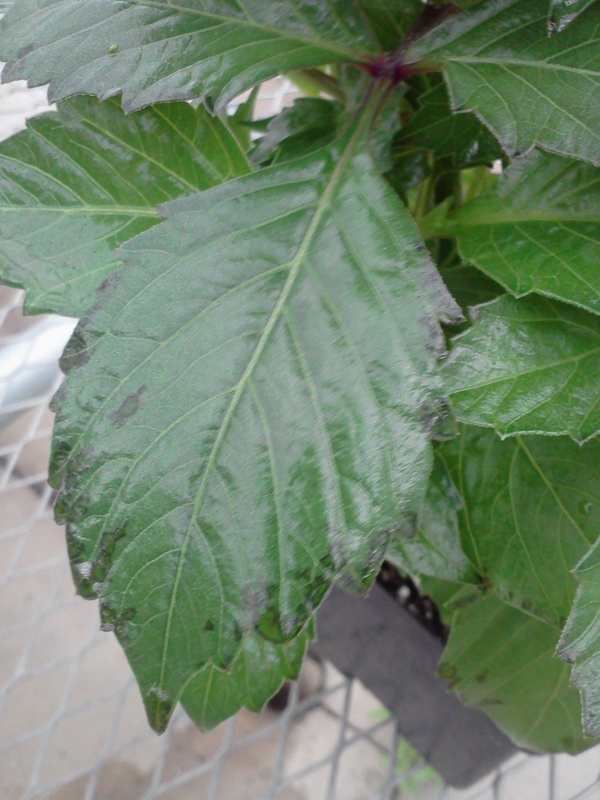 Many times the sprays used on plants in greenhouses only kill the adults because the larvae go untouched below the surface of the soil. You can get rid of these little flies by doing four things. 1) Put out sticky traps like Gnat Stix to catch the adults. 2) Remove the top ½ inch of soil. This is where most of the larvae live. 3) Keep the surface of the soil dry for a few weeks. It helps to “water from the bottom” which can be done by placing the plant in 2” plastic drip tray, only pouring water into this tray and allowing the plant to soak up the water from the bottom. 4) Apply Bonide systemic insect control to the soil surface as directed. * Photos from the UofF. 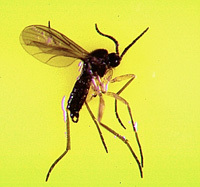 To learn more about fungus gnats go to the University of Florida Fungus Gnat page. This entry was posted in Killer Education and tagged Bonide, flies, fungus gnats, Gnat Stix, house plants on June 4, 2013 by Steve. Poor Bob, he’s in the process of dying either of overwatering and/or heat exhaustion from a radiator (or just plain neglect). We’re still trying to talk him down from the ledge, but he’s teetering ever more closely each day…. Lyman, Bob’s former best friend is feeling a great sense of denial, Anger… and is about to start bargaining… We’re going to it to a greenhouse for autopsy very soon. This entry was posted in Plant Obituary and tagged heat, not enough light, overwatering, radiator on May 13, 2013 by Steve. 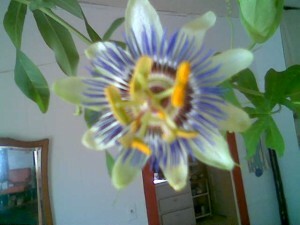 This entry was posted in Plant Obituary and tagged unknown causes on May 13, 2013 by Steve. Ivan was a simple but happy plant! He was born to captivity so he knew no other life. Sometimes at night he would listen to the old ferns talk about the open earth and he would ponder the unknown. Even though his thoughts would wonder he would always fall asleep to the comfort of his spot on the sill. Then the day came that changed the course of his life! A dried up spider plant was placed at the top of the stairs and all the plants were in panic. Ivan couldn’t even gather his thoughts before he was scooped up and placed in a hanging device on the east side of the bedroom. Long story shorter……. a few months later Ivan hang dry and forgotten, only to be mocked and left for show. But Ivan’s good nature perseveres, he knows no other plants will hang in this isolation chamber of plant horror so long as he hangs there! 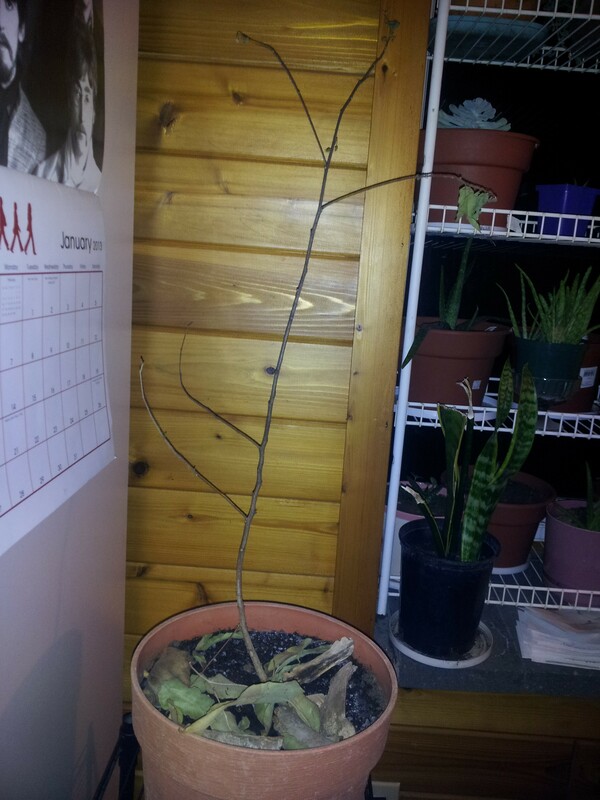 This entry was posted in Plant Obituary and tagged dry, Ivan on May 13, 2013 by Steve. Every Christmas season, these plants are EVERYWHERE. But where are they come June? Dead. That’s where. 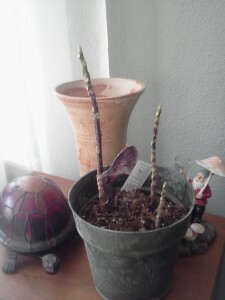 Sad but true: as soon as the holidays pass, there isn’t room in a person’s heart or home for this plant. It’s not like I’m going to rearrange the rest of my plants to make sure that this “festive” monstrosity get’s the “moist soil”, “medium light”, and “60-70 degrees” recommended on that laughable sticker attached to that gaudy foil disguising a cheap plastic pot without drain-holes. Repotting? Ha! Like anyone has their soil, post and tools on-hand in January. 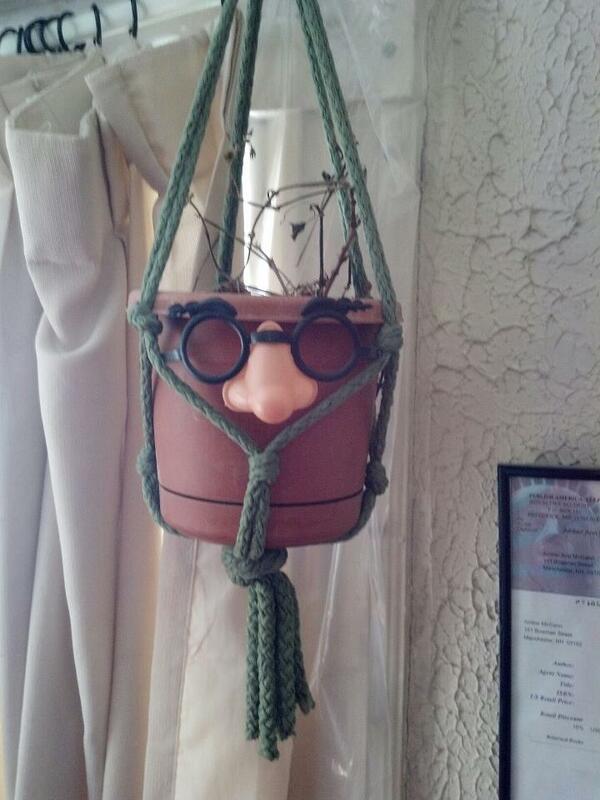 Anyway… I probably over-watered, then under-watered this plant. Trying to find room for it, I mistakenly placed it above a heat radiator that didn’t kick in that often because the weather had been so mild. One cold night after Three-Kings Day had passed, the temps dropped and that radiator was blasting out heat. I didn’t noticed the effects to the poinsettia for a few days until wilted leaves started dropping and making a mess on the floor. 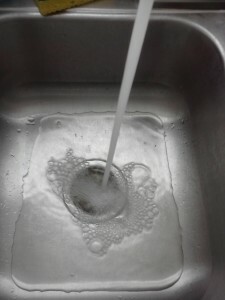 Then it went unwatered until today, when I’ve finally decided… “it’s time to say goodbye”. 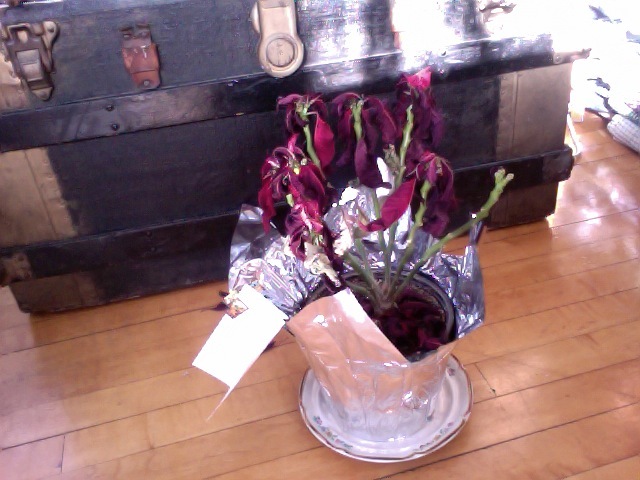 To the unnamed Poinsettia: I am sorry. Although you suffered the fate of so many poinsettias, neglect, rest peacefully that you were a shining star for at least long enough that my grandmother would spend $15 on you. I will keep the card you came with, in remembrance. I’m feeling a touch sad, mixed with anger for an industry (I’m looking at you Mid America Growers) that over-produces these plants to the point of them being so easily purchased and neglected. This unknown soldier of the holidays will be buried at about 3 pm today… Holly will be depositing it in the dumpster on my way to her car. This entry was posted in Plant Obituary and tagged overwatered, poinsettia, radiator, underwatered on February 4, 2013 by Steve. Luverne – 06/20/2012 to ? There are so many questions for Amanda and Stacy the candlestick jumpers and this has left them quite discombobulated. They really have no idea how Luverne the Eucalyptus citriadora passed. Could have been the shock of moving to her new home or a million other reasons. We will probably never know. Luverne was purchased with her sister, Shirley, at the Cold Spring Farmers’ Market. Luverne failed to thrive in her new living conditions. Despite her caretakers attempts to revive her, Luverne slowly but steadily lost her leaves and dried up. Her sister, Shirley, remains in good health. Stacy and Amanda plan to put off the burial until spring which is when they will finally add Luvernes scant remains to their compost pile. 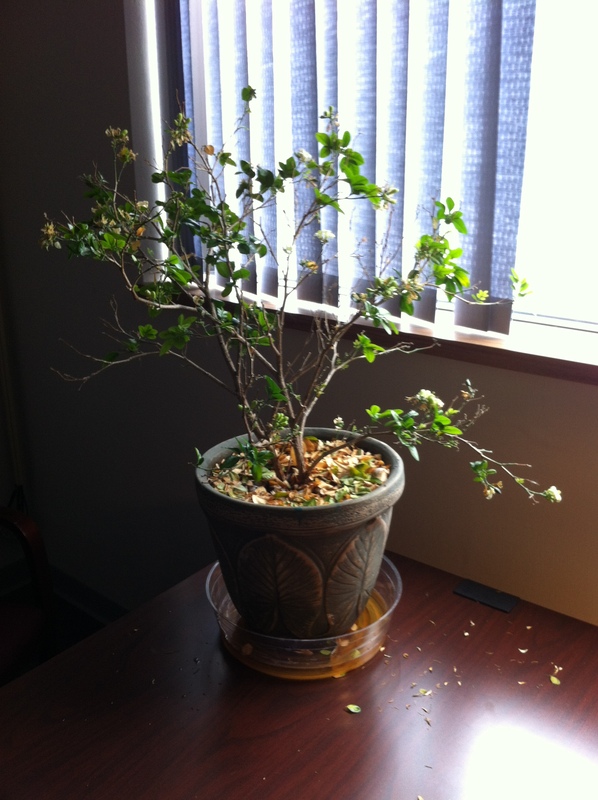 This entry was posted in Plant Obituary and tagged defoliated, luverne, unknown on January 29, 2013 by Steve. Ione will be buried Spring of 2013 in the compost pile. 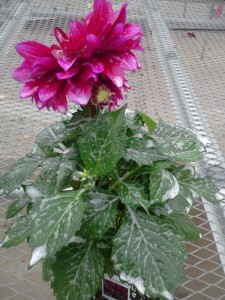 This entry was posted in Plant Obituary and tagged cold, ione, Obituary on January 29, 2013 by Steve. Have you ever had that “Oh, yeah. I have plants.” feeling? This usually happens when you come back from a vacation and your poor plant is clinging on to its last few leaves and screaming for water. 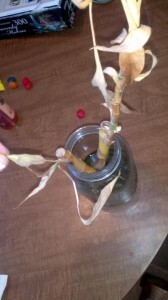 Many people give up on their plants and throw it into the dumpster but there are times when a plant can be revived and still lead a long healthy life. 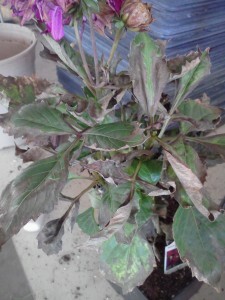 Here is a dried Croton: Let’s see what we can do to help him out. 1 – Remove dead material. Remember not to pull the leaves off if they don’t fall freely from the plant when you touch it. There is a good chance you will end up tearing the plant so clip, don’t pull. 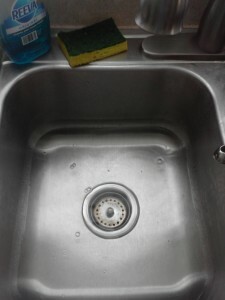 2- Once you have the plant clean it’s time to fill up the sink with lukewarm water. 3- Place your plant in the water and pour more water over the top to ensure a thorough and even watering. Allow to soak for 30 min. 5 – Remember that your plant won’t immediately recover from drying out. Fertilize your plant lightly after the leaves appear and keep the soil moist (but not wet). This process works for most plants but I’ve had the most success reviving plants with a hard stem. If your plant has all of its leaves coming from the base it might not bounce back as quickly but it’s definitely worth a shot. 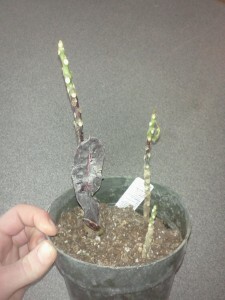 This entry was posted in Killer Education and tagged Croton, dried, house plant, Killer Education, Plant, underwatering on January 17, 2013 by Steve.